As Summer ends, Fall arrives to bring about cooler weather and the changing colors. Your lawn will soon become dormant to endure the winter season, thus making a fall treatment a must for your lawn. Fall treatment for lawns begins with knowing what you have to work with, applying the fertilizer before your lawn goes dormant. Fertilizing replenishes your lawns nutrients for it long sleep in the winter months. Choosing the right fertilizer for your lawn will depend on a few factors. Type of Grass – Grasses may need more phosphorous for deeper root growth, and nitrogen for darker green color. Soil Conditions – Soils can be like a gas tank. Sometimes nutrients run out and need to be replenished. Soils test are available to check soil conditions. Weather Conditions – Extreme heat or cold will force grasses to utilize nutrients faster when the weather is severe. Fertilizer blends are made by mixing two or more nutrient sources together. Also known as mixed fertilizers, blends contain particles of more than one color. Manufacturers produce various grades of fertilizers for the many types of lawns and plants. All fertilizer labels have three bold numbers. This label, known as the fertilizer grade and is a national standard. Third number is the amount of potash (K2O). 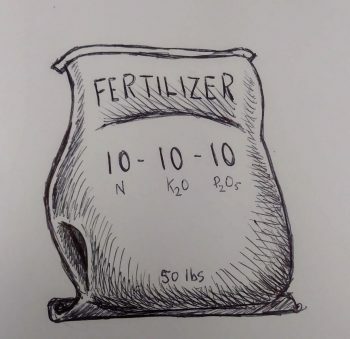 A bag of 10-10-10 fertilizer contains 10 percent nitrogen, 10 percent phosphate and 10 percent potash. The correct method to select a fertilizer grade is to have your soil tested. The soil test reports will recommend a fertilizer grade for your use. Using a broadcast or rotary spreader works well when fertilizing large lawns. It’s a good idea to fill it on a tarp, so you can easily gather any spilled fertilizer. Before filling the hopper, make sure it’s closed. Apply fertilizer around the perimeter of the lawn first, and start to move back and forth across turf in an orderly pattern. Slightly overlapping application strips to ensure that you cover the whole lawn evenly with fertilizer. Using a Drop Spreader for controlled fertilizer distribution, usually a typical suburban-size lawn. Overlap slightly on each pass to ensure you have adequate coverage. If dump fertilizer onto your lawn by accident, gather what you can. Follow up by using a stiff broom to spread out any remaining fertilizer as far as possible. Water the excess thoroughly, and do so again a few days later to help move that nitrogen down through soil. Posted in Lawn Care and tagged fertilizer, fertilizing, lawn feeding.